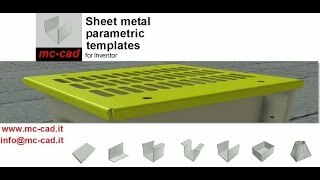 From the main menu you can select one of the seven available shapes, which will allow you to create a new file of sheet metal part. - Choose the rule of sheet metal to be used. - Enter size of the part (length, height, border, corner ....). - Select one of the four "treatments" preset through the configuration menu. The configuration menu allows you to set the color to display for each one of the four treatments, one or more iProperties to be created and its value. It also allows you to create a rule for the iProperty description which will be created from the combination of user-defined text and the size of the detail. A description will be constantly updated with the size and detail. It can be used as custom iProperties to be able to fill title blocks and Bill of Material (BOM). The menu also uses a key for changing the sheets created with the APP MC-CAD; this button automatically recognizes the component created and opens its graphical interface for editing. Changes to the sheet metal can also be performed from within an assembly mode "edit part." You can access the online help to keep yourself up to date on the installation and how to use the commands. Works great, works simpel, awsome job, thanks !